Born in Vidin, a small town in Bulgaria, the artist spent part of his childhood in Bucharest before attending boarding school in Vienna. About 1902, he studied painting in Vienna and in 1903 or 1904 went to Munich, where he enrolled at the Heymann Art School. During this period, he worked as an illustrator, contributing cartoons to such German periodicals as Jugend and Simplicissimus. He also further studied in Berlin. In 1905, about the time that he changed his surname to Pascin, he moved to Paris, where as a member of an international circle of artists who frequented the Cafe du Dome, he became a leading modernist. He had his first one-man show at the Paul Cassirer Gallery in Berlin in 1907 and later exhibited at the Berlin Secession and the Cologne Sonderbund-Ausstellung. 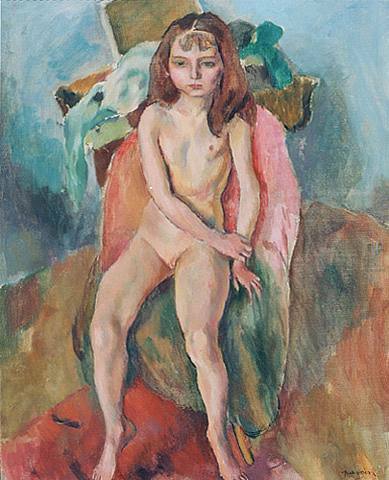 Jules Pascin stands, like his friend Modigliani, in the great tradition of the romantic, bohemian artist. A charming, lavish host, Pascin was closely associated with the artists, musicians, and effervescent literati of the 1920's. The Bulgarian-born artist was a major figure in the School of Paris before coming to the United States, where he became a naturalized citizen. 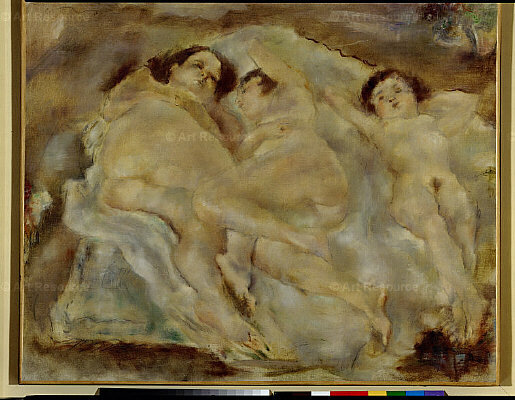 On immigrating to New York City in 1914, Pascin associated with several progressive painters, among them Walt Kuhn, Yasuo Kuniyoshi, and Max Weber, who were influenced by his figurative style in which he conjoined elements of Expressionism and Cubism with a highly personal vision of his environment. His aesthetic, especially his subtle handling of line and tone and his fine draftsmanship, was also influential. In the United States, Pascin traveled extensively, and was particularly drawn to the southern states and to the Caribbean islands. He recorded his travels in brilliant, instantaneous pencil sketches, sometimes touching them with delicate washes of color. Dispassionately he painted field workers and the picturesque citizens of a tropical land steaming in the sun, mules and wagons waiting in the shade of palm trees, yachts swinging in motionless harbors.